Oscar Pistorius, Ellie Simmonds and Natalie du Toit are among the stars featuring at the London Paralympic Games - BBC Sport picks out some of the likely highlights from 11 days of sporting action. 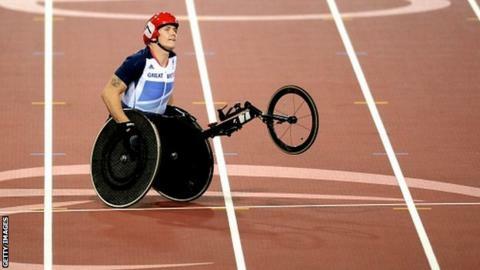 Athletics - Britain's leading wheelchair racers David Weir and Shelly Woods will hope to finish the Paralympics on a high in the marathon (men 11:30, women 11.32), with the action due to end on The Mall at around 13:00. Wheelchair Rugby - Great Britain failed to make it through the group stage and so will not be involved in the medal matches at the Basketball Arena, with the battle for bronze at 12:00 and the gold medal match at 14:15. Football 7-a-side - The final medals of London 2012 will be decided at the Riverbank Arena, with Brazil v Iran for bronze (13:30) before Russia v Ukraine in the gold medal match (16:00). Great Britain play the USA in the 7th-8th place classification match (08:30). Closing ceremony - After 10 days of competition, the curtain comes down on the 2012 London Paralympics. Kim Gavin, artistic director of the Olympic and Paralympic closing ceremonies, says: "It will be a festival of flame. Through Coldplay's music we are going to take you through the seasons from autumn to summer. There will be a tribute to Help for Heroes and the Union Jack will be revealed for the national anthem in a special way."